Rana Safvi writes about the Persian Ramayanas which number around 23. Some of these were translated from Sanskrit and others from Awadhi. The Ramayana of Masih is a true exposition of our composite culture – innumerable words and allusions related to the Quran and Iranian literature have been used to enrich this masnawi and to lend colour to the story. Sanskrit and Hindi words sanyaasi, darshan, jharoka, rasta and paan have been assimilated to enrich Indo-Persian literature. This assimilation was indispensable for the Persian language to serve as a mirror reflecting our sentiments and environment. 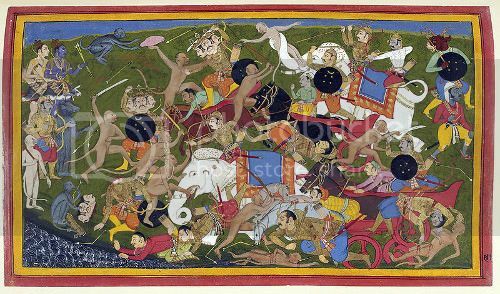 His Ramayana was in the style of a Persian masnavi and not in the tradition of Valmiki’s division into cantos or kandas. Masih was targeted by fanatic Muslims for writing the Ramayana and had to justify his stance in the beginning of the book under the heading Dar Mazammat-e-Hussad (Condemning the jealous). The visible presence of a European corps of soldiers was thought to be essential to the maintenance of empire. From the daily drill and parade to his imposing uniform, the European soldier’s importance was as much symbolic as physical. However, medical and military observers attacked these same men for their supposedly wanton and ‘inferior’ behaviour, and display of dangerous tendencies which openly threatened not only military security, but broader imperial discipline. Alexander Heatherly Azad was in fact well known in Delhi poetical circles under his pen-name Azad as a pupil of ‘Arif and he took part in the musha’iras arranged by Bahadur Shah Zafar and the princes. He is mentioned in Farhatullah Beg’s Dehli ki akhri shama, translated by Akhtar Qamber as The Last Musha’irah of Delhi, as sitting among the 40 poets gathered in the courtyard of a great house for a night of poetry presided over by Mirza Fakhr al-Din, Bahadur Shah Zafar’s favourite son and, under the name Ramz, a fine poet in his own right. Azad was ‘one of the great poets of the Urdu language’ (Saksena 1941, pp. 73-4). The rich, complex synthesis of the arts, culture, mysticism, shared sentiments, and indeed, of serendipitous winds passing through the open doors of history and influence, are more than amply evident at Ibrahim Rauza, the mausoleum of the medieval sultan of the Bahmani succession state of Bijapur, Ibrahim Adil Shah II. From the striking domed entrance gateway, the serene lawns, to the two structures upon a plinth (the tomb and the adjacent mosque), all fecund with the intense intermingling of a staggering range of ideas, Ibrahim Rauza is truly, a feast for the eyes. But Victoria’s advisors would never consent to giving the diamond to Duleep. They would not relinquish any part of their Indian territories. They knew what the diamond symbolised and, dreading another Mutiny, Duleep was followed by British spies and eventually exposed as a traitor for consorting with various dissidents; mainly those Russians and Irish men with whom he had been making plans to march an army on the Punjab by route of Russia and Afghanistan. In response Duleep was exiled from England as well as India. He was forced to live out the rest of his life on the European continent, where he died at the age of 55 in a Parisian hotel. Sidin Sunny Vadukut writes about two frequently ignored episodes in Indian history: the Japanese occupation of Andamans and Indian participation in the First World War. At least 75% of Indian people I speak to have no idea the Japanese occupied the Andamans. And even fewer know how brutal the three-year long occupation was. The only book I have been able to source on this is Jayant Dasgupta’s Japanese in Andaman & Nicobar Islands: Red Sun over Black Water. It is a very short book that does little more than push the door ajar on a fascinating chapter of Indian history. The period deserves much greater coverage and analysis. I am not exactly sure why it remains ignored. Perhaps because it happened at the fringe of an irrelevant theatre of war and had very little participation from the countries that dominate popular WW2 historiography. Dr. S Gregory has a write up on Anthropology and anthropological teaching in Kerala. 2013 marks the 25th year and he has a history. The next carnival will be up on Dec 15th. If you have a link, leave it in the comment.